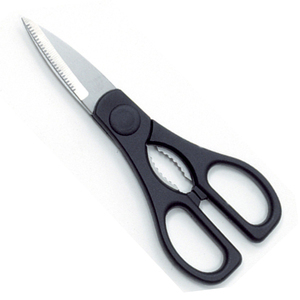 These heavy duty all purpose kitchen scissors are engineered for strenght and sharpness. These kitchen scissors feature stainless steel blades that easily cut through food and food packaging, which makes them perfect for home canning. You can also use these kitchen scissors on pastry dough, parchment paper, vegetables and herbs. As a bonus feature, the scissors have a nutcracker and bottle openor in the handle.